The first item I picked was a two-piece strapless embroidered crop top and shorts set, sold in one size. Included in this set is an asymmetric strapless crop top with a stretchy band at the top and a bandeau-like lining underneath, so you don't have to worry about the wind! 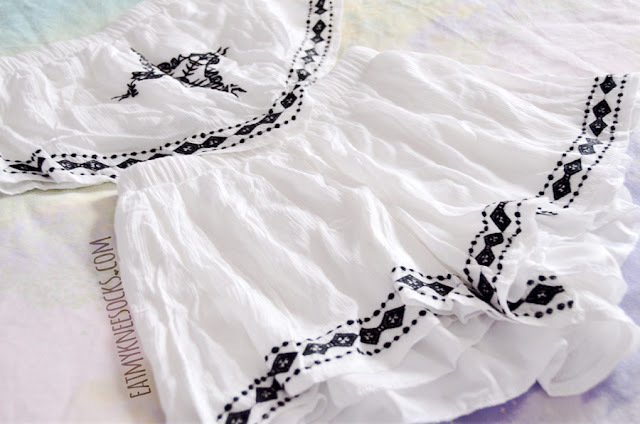 The shorts are also lined, with a stretchy waistband flowy, fit, and geometric embroidery at the front. This two-piece set has a style that's perfect for summer, and the fabric is great! Unlike a lot of white clothing, it's not sheer at all, and the material is comfortable, breathable, and high-quality. The fabric is a bit different from the one in SheIn's product photos, but it's great nonetheless. The print on the top is slightly off-center, but since it's got a relaxed and flowy fit, you really can't tell when you're wearing it. 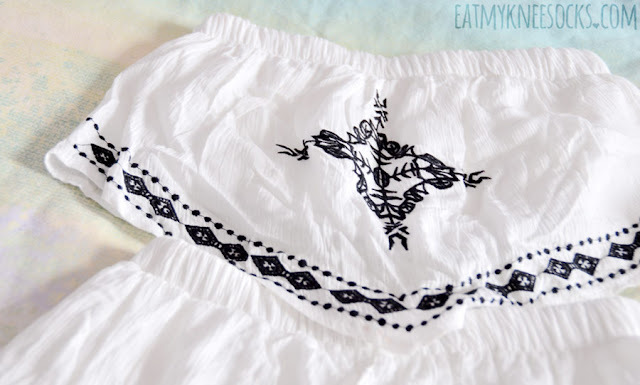 Even though it's one-size-only, it stretches to fit a huge range of sizes, and you can choose to wear the shorts as high or low on your waist as you'd like. All in all, this two-piece printed strapless set is amazing. I picked it simply because I thought the style was interesting and wanted to give it a shot, and I really didn't expect to love it so much! It's such a wonderful set for summer, with a fit that elongates your legs and makes you look taller! 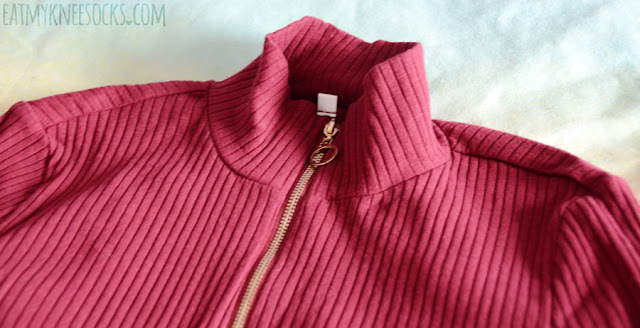 The second item I got was a wine red ribbed mock-neck long sleeve knit top with a golden zipper accent at the front. This top is sold in sizes XS-L, currently costing $16.49. The store photos make it seem like this top is a much darker color; my photos are filtered so it looks lighter than it actually is; I'd say the true color is in between, not quite as light as pictured in these photos but definitely significantly lighter than SheIn's photos, and more reddish than purplish. This top has a very flattering, form-fitting yet comfortable fit, and the front zipper lets you wear it as a high-neck top or unzip it for a different look. I got the XS, which fits true to size, and the sleeves are a perfect length. The knit fabric is stretchy and figure-hugging, but not too tight. One of the reasons I chose this was actually because the style reminded me of the UNIF Noob bodysuit, which also has a high neck design, ribbed fabric, and ring zip down the front. 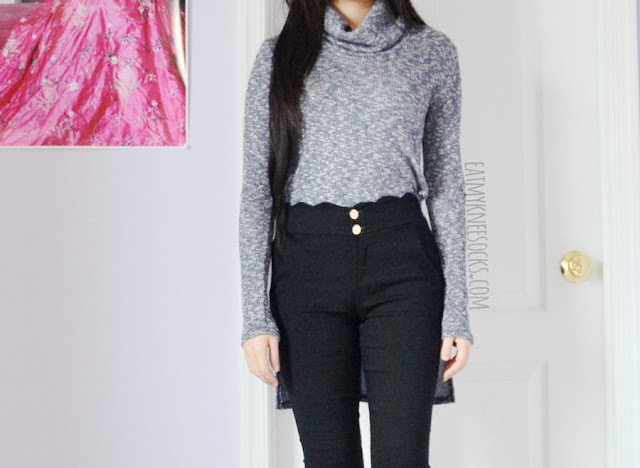 Despite the color differences, this top is accurate to SheIn's pictures in terms of cut, and it provides wonderfully unique twist on a basic silhouette. It's comfortable to wear and great with all sorts of pants and skirts, whether you want to wear it as part of a casual look or get dressy! 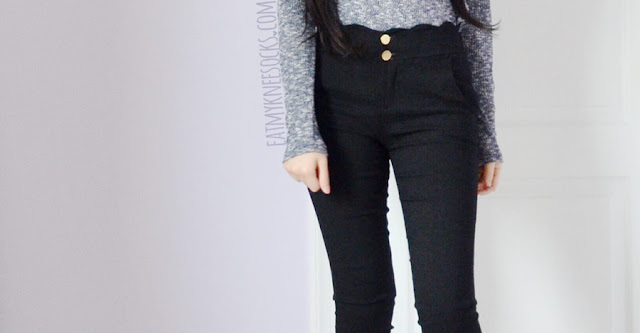 The third item I got was a pair of scalloped black high-waisted pants, sold in sizes S-XL for $15.86. These pants are made of a stretchy material that makes them almost feel like dress pants or work pants, but with a figure-hugging fit akin to that of skinny jeans or leggings! 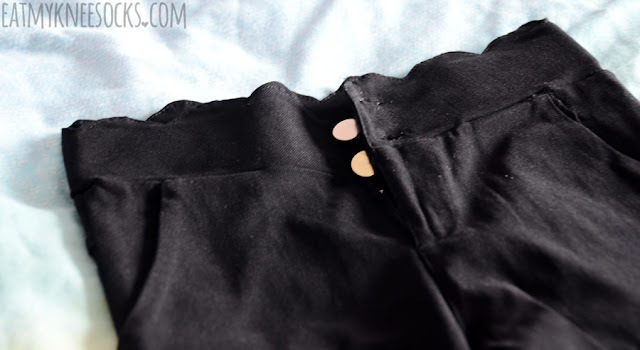 There are two angled front pockets, along with a zipper, two golden buttons, and a scalloped high-waist design that help it stand out from your regular pair of high-waisted pants. The fabric and fit is surprisingly comfortable, and the high-waisted design does wonders for your figure. I got these pants in size S; they fit great for the most part, and the material makes them a lot more comfortable than jeans, though they tend to bunch up a little around the legs. Also, the holes for the buttons weren't fully cut open when I received them; they were only half cut. This was an easy fix with a pair of small scissors, but nonetheless, it detracts a bit from the overall experience. These are a great choice for anyone looking for a pair of comfortable, flattering, and different high-waisted pants at an inexpensive price. They fit great and go well with pretty much any top, and, aside from how they tend to bunch up at the legs, they're amazing! I've been very happy with my latest SheIn packages, and this one is no exception! Feel free to look at my other SheIn reviews for more information about their products; I'm also selling a bunch of stuff (including many items featured on this blog) on my Depop (@fichellemu), so check it out!